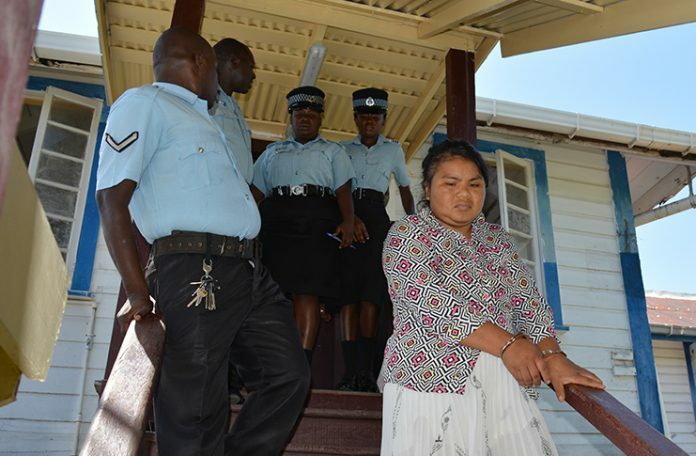 Guyana Chronicle:- A REMORSEFUL mother of two who allegedly killed her three-year-old son last Saturday has been charged with murder and appeared before Magistrate Peter Hugh at the Cove and John Magistrate’s Court on Wednesday. The 26-year-old mother of two, Brenda Ferreira, was not required to plead to the indictable charge. She was unrepresented and the court has ordered that she undergo a psychiatric evaluation. The evaluation report is expected to be submitted to the court when she returns on September 12, 2018. The housewife is accused of stabbing her three-year-old son Ramdeo Ferreira to death. He was found in a bloodied state on a bed in the family’s wooden shack at their Foulis, Enmore, East Coast Demerara (ECD) home. Neighbours said the suspect, who was armed with a knife, was seen chasing Ramdeo in the yard. Minutes later, ranks attached to the Enmore Police Outpost responded to a report that she had stabbed the toddler. The mother of two had related that she had a dream that she was going to die and she did not want to leave Ramdeo behind, since he was her favourite child. It has also been reported that Ferreira is several months pregnant and concerns have been raised as to how the child will be raised. One prison official related that such a situation is nothing new for the prisons and after giving birth, Ferreira will be allowed to join and attend a clinic at the New Amsterdam Hospital. When she is due, she will deliver her child at the New Amsterdam Hospital. She will live in a separate section of the prison if it is deemed that she is capable of caring for the child in a proper manner. If upon evaluation, she is deemed fit, she will be allowed to keep the child for 12 months. The child will be cared for by the state.